Inzievar Woods is a managed woodland – the environment, local community and economy are all taken into consideration in deciding how best to manage each part of the woodland. This ensures that there is enough in the woodlands for everyone to enjoy whatever their priorities. 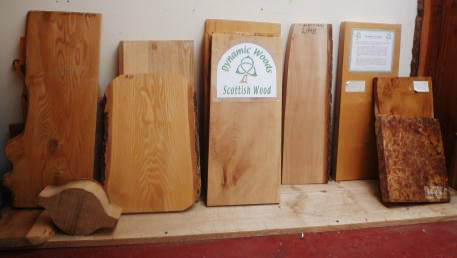 Inzievar and its sawmill are suppliers of Scottish hardwoods – oak, elm, beech, sycamore, ash and larch – which can be used as naturally durable beams, flooring, and decking. The NEES (Natural Energy Efficiency and Sustainability) Project is a trans-national partnership comprising 8 agencies from 5 regions in the Northern Periphery of Europe. The Project began in 2011 and was completed in April, 2014. During this time the NEES Project selected 15 best practices in products and services that use renewable and recycled materials; implemented 6 Pilot Projects to demonstrate these best practices in different regions and developed a Vocational Training course aimed at training stakeholders in the application of this approach. The 8 Partners have also hosted over 12 public events, and provided input into regional and European policies regarding energy efficiency and sustainable construction.